How could this have happened? How can I fix it? I'm afraid to try to pull the DT from the BB and REALLY don't want to start over. Do I have any options? Am I okay to pull and braze? I'm really upset as I've spent A LOT of time on this frame to make sure that everything is perfect. It's my 4th frame and was/is supposed to be my best one yet. The build quality between this one and my first is 10 times better and I'll be so sad if I have to ditch it. Angles can shift with heat, especially in the BB shell with it's uneven mass distribution. This is one reason that some will tack the complete main triangle to "fix" the various angles and lengths at one time. What is the filler for the DT and for the ST? Are there pins in the joint of both? To pull a pinned joint they have to be first drilled out. At this point the "best" choice is to either start over with new ST, DT and shell or cut off the majority of the DT and grind out the rest. If you're inclined to do the first then after reordering the new stuff go back and try to bend the DT and ST back to the right angle. Either you do and continue or you screw up the tubes even more and then fall back on the best, the replacements. Andy. Thanks Andy. The filler is silver and currently there is only one pin in the DT joint. I was afraid that I'd have to start over after this all happened. Could I try to heat up the joint a bit and try to open up the angle a bit? If not then I'll have to bite the bullet and order some new metal. Maybe I'll tack the triangle this time. Man what a bummer!! It was turning out to be a beautiful frame. Maybe a bit ghetto but what about bending the V out a little. It won't take much to move the spread 1 degree. Think of it this way: if you brazed the seat tube into the BB shell and then measured straightness and noticed the tube was angled down 9mm towards the end of the tube, a simple cold set will bring the tube up and into alignment. Last edited by Nessism; 02-18-19 at 09:55 AM. Since my method of putting tubes together is completely different than yours I can't provide much advice. I 1st braze the seat tube to the bottom bracket making sure the angles match the design and it is aligned. Then I assemble all the rest of the main triangle in my fixture. Because it is the same as a full size drawing it assures the tubes stay true to the design. I've worked out a method of spotting and aligning so that after brazing all the joints everything is where it should be. . I am pretty sure I recommended a different order of assembly in a previous thread, starting with the seat tube, then the ht/dt, then the front triangle. That's a traditional building technique for a reason. Individual joints always seem to settle out at an angle that aren't what you wanted. Bottom brackets in particular have a way of moving that I don't want to have to predict, so I like to have everything else nailed down first. I assume this bike is for Brandon. Since this is the bad advice forum, I would spring the tube out and finish the build. I really think the effects of that are overblown. Make sure the miters still fit, this is why bikes that have been sprung fail. Reheating is not a good idea. When I reheat a tube, it's going to metal recycling. BB shells and lugs can be reused if disassembled with care. Am I reading it wrong that all that is bad is a bb shell and a downtube? In that case, just replace them. Throwing stuff out is good for the soul and good practice moving forward. Don't keep it around, that is just bad energy you don't need. I had a fork I didn't feel good about and didn't want to use that I carried around for 36 years. Finally cut it open and found out that it was perfectly fine to use. I wish I had done that 36 years prior. Thanks all. Yes this build is for me. Had I not had this issue, I would totally feel comfortable with it going to someone else though. @doug - I pretty much did the same (or so I thought) thing, but in a vertical fixture. All the main tubes were mitered and dry fit in the lugs many times prior. Everything was great. @unterhausen - So you think springing the tube will work and brazing will work? The miters are very good and once it's put in place, they are very tight. Yes, the only things that are officially bad are the DT and BB angle. The ST is already brazed in. I did order some new tubes and shell though just to have something to fall back on. I assumed that grinding out a DT in the BB pocket would be pretty tough and tedious at best. 1) Cut off down tube about 1/2" above the BB shell. 2) Use a hacksaw blade in a holder tool and cut radial slots down into tube until you just hit the braze. About 5 slots will be enough. 4) Aim the torch flame on the inside surface of your down tube, heating it quickly. 5) Once good and hot use some strong pliers and peel out one one piece at a time. 6) After the shell cools use a sanding drum to dress the shell ID. All this said, I still say cold set the ST to DT angle, or at least try. doug - I pretty much did the same (or so I thought) thing, but in a vertical fixture. All the main tubes were mitered and dry fit in the lugs many times prior. Everything was great. I'm not sure I was clear about what I do. After brazing the seat tube to the bottom bracket as a separate unit, I assemble and then spot braze all the rest of the front triangle in my fixture. I don't separately braze another joint outside of the main triangle. The whole assembly keeps all the tubes true to the original frame design as I'm continuing to spot, align, braze, align each joint. If I understand you correctly you did not leave the whole triangle assembled as you brazed your bb to dt joint. Would I be right in thinking the following ? If the OP had tacked the whole main triangle before brazing the ST/DT joint, the joint would try to close up (as before) but being restricted from doing so, would put a 'hidden stress' into the structure. 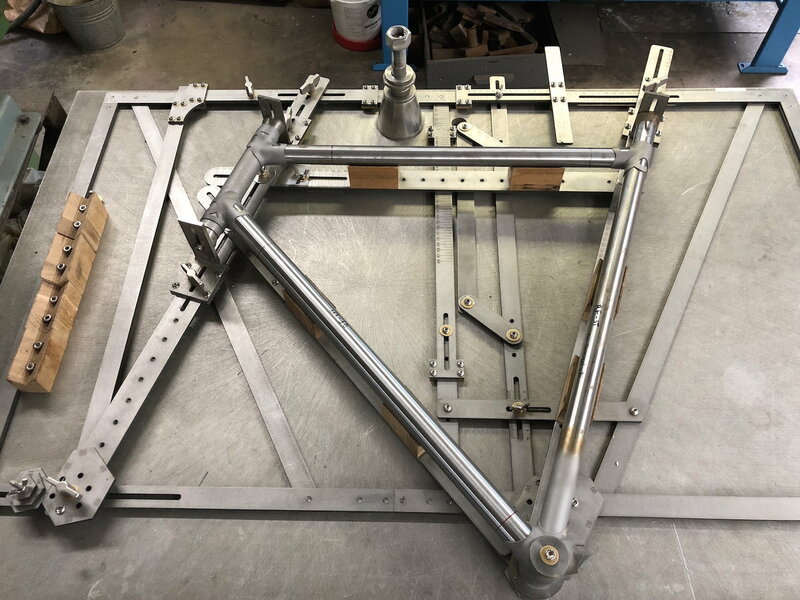 If this is the case, then if the OP forced his misaligned tubes to fit as intended and finished up the frame, would it give the same 'hidden stress' as would be present if he had tacked the whole lot together first? As a noob to the whole experience my gut instinct is to cold set the tube angle to avoid having to replace main tubes which is a major PIA. The first frame I built I did just that and it has 10 thousand miles on it without trouble. I have done some of the same but with the ST/DT angle too large by around the same amount. I squeezed the tube in (well, I actually used long Omar's bending bars slid inside the tubes touching in the BB). I got the needed spread but suffered a collapse bulge in the seat tube's front just above the shell. Now this was when I was building some version of the "hockey stick" process and using brass for the seat tube filler. I continued to complete the frame, no one spotted the issue unless I pointed it out. I don't remember how many years I kept it but it's long gone now. Part of the way to reduce internal stress is to spot, align and braze in a way that doesn't create it. There is a lot that goes into brazing a joint the most effective way possible including what size tip to choose and the heat pattern one follows. The heat from brazing will always create distortion and it is the job of the builder to know how to minimize its effects. Thanks once again for the replies. I have some new pieces coming my way and will attempt to work on it. I have to admit that with the frames I've been building (all for me), I've been trying different things to try to learn as much as I can. I certainly don't mind making mistakes, and here is a prime example of one. This next attempt, I'll be sure to have the full front triangle put together and pin and tack each joint and then align and then move on to completing the joints. Thank you for all of your insight. I'm learning a ton. Sorry to belabor this point but there is something I don't understand. More specifically, what's wrong with cold setting the ST/DT/BB shell assembly back to the proper angle and moving forward with the build? If I'm building a frame and braze the ST into the BB shell and then check alignment using my surface plate, and the ST is 9mm low where the seat cluster will lay, I'd be perfectly happy to bend the tube to straight and continue with the build. Am I a heathen here? Assuming no (hopefully), then what's different in this situation? It seems to me you can simply spread the angle, which will divide the cold setting between two tubes, not just one. Any "bowing" of the tubes would be so small as to be negligible. Last edited by Nessism; 02-20-19 at 06:50 AM. Nessism- If the involved tubes were to somewhat evenly bend/bow through out their lengths then I agree that few would even be able to tell and that the tubes' integrity won't be "challenged". But I don't think this reflects how beams bend nor the changed strengths in the HAZ. I related my experience specifically to show this. That beams bend to a greater degree closer to the fixed end and that the strength loss in the HAZ, located right at the tube/beam end combine to make this end portion most likely to move. Remember that unlike a chainstay socket in a lugged shell, where the stay doesn't contact the other stay or the seat tube even, with well done miters the seat and down tubes do touch and have been brazed to each other. So the correcting isn't so much the shell bending but is the tubes doing so. Morning. Last night I went and played with the frame a bit and through some gentle massaging I was able to cold set the angle do the desired setting. I was careful not to overdo it, and kept measuring the straightness both the ST and DT themselves while doing so. I can't measure any deviations whatsoever in either tube and my angles are what they should be. So I then proceeded to pin and flux the remaining joints and tack them all in place so that the main triangle is set. Everything went as well as I could have hoped considering my initial miscues. I checked the alignment along the way and it seems to be spot on from what I can see. This week I will braze the joints completely and move on with the build. I'm a bit relieved. Throughout this process of building frames I love that there are times that certain mistakes that initially seem catastrophic (to me at least) , are actually able to be fixed. That hasn't always been the case, but I'm learning so much it's very exciting to me. I can't get enough.